Humanist is a productivity app that endeavors to teach you about yourself and others, and about the interactions that happen between you. It was developed by AppPro Studio, costs $2.99, and is compatible with an iPhone, iPod Touch, and iPad but requires iOS 4.0 or later. Humanist is split into two main components: Character and Biorhythms. You start by putting your gender and date of birth into the About You section. 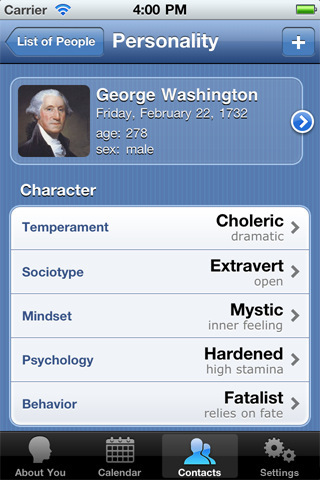 The app processes this info and then gives you a character summary and your biorhythms for today. The character summary is broken down in to Temperament, Sociotype, Mindset, Psychology, and Behavior. In the biorhythms section you get to pick any month out of any year in time and you are given a grid with your Health, Emotions, and Intellect graphed. The graph shows what days these three elements are highest and lowest for each month. What do the character outline and biorhythms mean in terms of your interactions with different people? Well Humanist attempts to explain this in the Contacts section. The app imports the birthdays of the contacts in your device and when you select a person, you are given the same character breakdown and biorhythms but in addition you get a Relations With You section. The Relations With You section is split into Influence, Business, and Marriage. If you are convinced that the biorhythms given to you in Humanist are accurate, you can use that information to determine which days will be better for certain plans you may have and organize your schedule accordingly. The app provides you with a calendar and every day has a colored dot in it indicating what your biorhythms will be for that particular day. 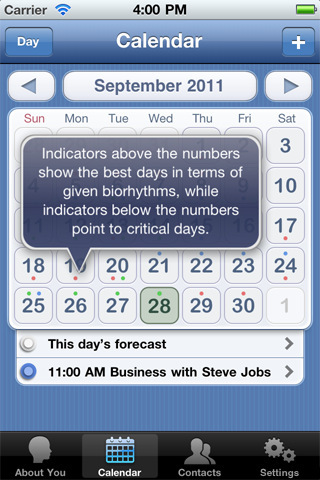 You can also select any of the days to read the summary of your predicted mood for that day. Whatever you schedule in your Humanist calendar can be synced with your master calendar. I am not sure whether the findings in this app are based on astrology, numerology, or what, but they are pretty accurate. Apart from the skepticism I feel about Humanist, the biorhythms were surprisingly accurate and I found the character summaries insightful. AppSafari review of Humanist was written by Vanessa Paszterko on December 3rd, 2010 and categorized under App Store, Calendar, Fun, Productivity, Social. Page viewed 6009 times, 1 so far today. Need help on using these apps? Please read the Help Page. For only 0.99 now! For a limited time.